This article was originally posted on http://apartmentprepper.com, and used with permission. There are a lot of things that a person can do in 8 minutes. For example, wash the dishes, make a sandwich, check email, or make a cup of coffee. Eight minutes is all a burglar needs to rob your home. That’s pretty fast considering this is a new environment for him, because all homes are different. Burglars don’t like to hang around inside your house for long. The longer they are inside, the higher the chances they’ll end up on the inside of a jail cell. These tips will slow them down and hopefully get them out of your home with less of your valuables. Synchronize your watch to “the break-in clock.” By the time you finish reading this article, the burglar has already moved onto the next target. The Break-in Clock: 1-2 Minutes: Once a burglar has gained access into your home he or she will primarily use the same search pattern, this is if the burglar alarm hasn’t gone off yet. The first stop is directly to the master bedroom. They will look for cash, jewelry, or anything that might be valuable. People often make the mistake of leaving money or jewelry in the most common areas such as a dresser, under the bed, the closets, or bedside table. Keeping a safe in your home is probably your best bet to keep all of your cash and jewelry secure. Burglars won’t have enough time to break into the safe, but if it’s not bolted down, chances are the burglar will be taking it with him. 3-4 Minutes: The next room of your home is the bathroom. Burglars will always check your medicine cabinets to see if there is any narcotic prescriptions. Try putting these in a first aid kit tucked under the sink or behind the toilet. 5-6 Minutes: The next stop may be the living room, kitchen or family room, so don’t leave easy-to-sell, high-value, compact items such as laptop computers, iPods or cameras lying around or you can be sure to lose them as well. Interior locks on the doors leading to your study or gaming rooms would frustrate a rushing burglar’s ability to cash in on your electronics. Valuable personal information is often stored in your personal computers. It’s always safer to have your computer password protected, and ideally only store important files offsite in an online data cloud storage website such as Dropbox. To protect your online passwords, credit card information and more, try 1Password, a password generation and encryption software. 7-8 Minutes: After the burglar has gathered everything he may need, he will usually call a partner to meet him and load up all of your goods into the car or van. Once all of the goods have been loaded, the burglars drive away to their next target. It’s a never ending cycle. “It usually takes me about 8-12 minutes to get in and out of your home. It’s as easy as that!” boasts burglary professional Pat O. In closing, there are a lot of things that you can do to avoid a home burglary. A security system is a no- brainer. If that’s not an option, leaving a TV or stereo on during the day usually helps burglars avoid your home. This usually indicates someone is home. Also, most burglars won’t even attempt entry if they know there’s a large dog in the home. 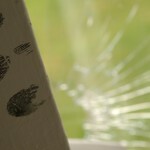 Burglaries can result in loss of both valuables and peace of mind. Therefore, it is important to take adequate steps to protect one’s home and increase its security. Begin by accepting that all homes are vulnerable to theft and burglary and then, act to step up security and keep one’s home, family and belongings safe and secure. This post was written by Kevin Raposo. He writes for SimpliSafe, the wireless security system that helps you take control of your safety.